Study and research into Cambodia’s elephant population is something that has been undertaken only recently and it is still in its infancy. Information is therefore very sketchy and potentially unreliable. While this information source is considered the very best available, accurate data on wild elephant populations is difficult to obtain and scientifically verify. 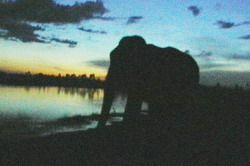 Scientific surveys of Cambodia’s wild elephant population were first undertaken in 2001 and highlighted the difficulties of studying low density populations in forest habitat. The results have led to estimates of the population being between 400-600; some way below previous guestimates of up to 2,000. In a country so rich in habitat, one might have suspected that Cambodia would support a much larger population, but it seems elephants have been relentlessly hunted for ivory, meat and other products. It appears that the prevalence of hunters has made the remaining elephants extremely wary of humans and they appear to be constantly on the move. Another threat to the wild elephant population is the continuing prevalence of mines in the forest. Cambodia has a comparatively small population and large areas of natural habitat and it could be possible for the elephant population to recover, but such a move would require a positive environmental policy and rigorous enforcement from the government. 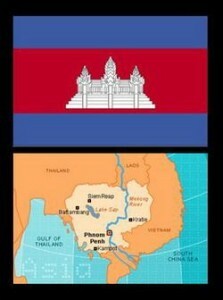 Given the political and economic circumstances in Cambodia, this would almost certainly require international support and financing. 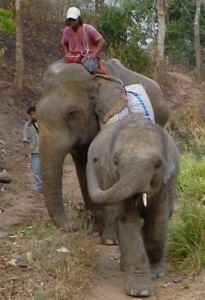 Cambodia’s domesticated elephants are usually owned by clans of the Phnong minority which has a tradition of elephant keeping. The tradition is however fading and as a result, elephant catching, training and handling skills are not being passed on. Elephants are rarely bred in captivity and due to the ever decreasing wild population, are infrequently captured today. The captive elephant population is therefore ageing and is likely to fade into insignificance in the next decade or so.